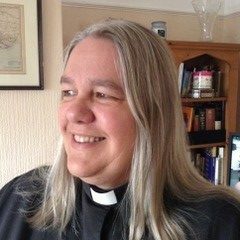 We are thrilled to announce that Bishop June has appointed Reverend Sandra Birdsall as the Mothers’ Union Chaplain for the next Triennium. Revd Sandra Birdsall is the Assistant Curate in the Parish of Penarth All Saints. Before studying for ordination, she was the Principal Clinical Scientist in charge of the Haematology Genetic Diagnostic Laboratory at the University Hospital of Wales. As a mother of two, she fully understands the demands of modern family life. Sandra will bring her energy and enthusiasm for the Mothers’ Union and in particular, her commitment to actively contributing to the Diocesan Vision. As a member of the Llandaff Diocesan Spirituality Group, she is well placed to contribute to the spirituality aspect of MU Diocesan faith and worship events and we see this as an is exciting development, which will enhance the good work being undertaken by the Faith and Policy Unit. Mothers’ Union are assured that Sandra will support the Diocesan President and the Trustees in their aims and objectives for the coming triennium. Revd. Sandra will be commissioned by Bishop June as Mothers’ Union Chaplain, along with Sue Rivers as Diocesan President on Sunday 27th January at Llandaff Cathedral during Choral Evensong (3.30pm). Refreshments will be provided following the service in Prebendal House.